The human eye sees the portion of “visible light” spectrum (beyond the visible light is a light spectrum including infrared light). IR light adversely affects the accuracy of the reproduction of color, for this reason, all color cameras employ a blocking filter to minimize or eliminate IR light which reaches the sensor imaging. This means that the IR corrected lenses are not necessary in the standard color cameras. The Day / Night cameras and monochrome can benefit from IR corrected lenses. The CCD device within the security camera can detect IR light and use it to help illuminate the observed area. In fact, using ordinary lenses in cameras monochrome or day / night often leads to blurred results or even images out of focus. This occurs because the wavelength of IR light differs from visible light, so the focus point of IR light is displaced compared to visible light. Consequently, when ordinary lenses are used and the focus is set on the day, the photo is out of focus or becomes blurred at night when the lighting is used IR – and vice versa. This problem can be corrected by using the IR corrected lenses that focus both visible light and infrared in the same vertical plane. The IR corrected lenses are not only used with IR lighting at night, many of the sources of light include a portion of IR light spectrum. Therefore, the lenses in a monochrome or day / night camera provide a stronger image since all the light is focused. You also get a more textured picture compared to ordinary lenses. Zoom lenses are more complex but offer high functionality. These can be adjusted remotely to allow variation of the focal distance and keep focus while tracking is done. 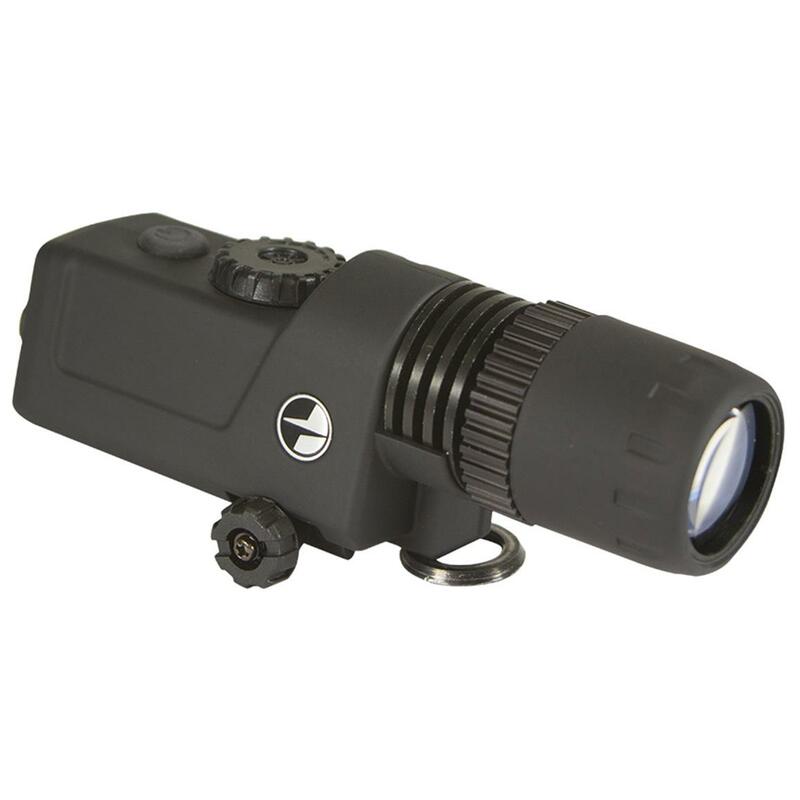 This means that a lens can be used to cover a wider area – until an intruder is detected. At that time, you can make an approach to capture the details of the face. Generally, zoom lenses incorporate a motorized zoom, focus and features auto-iris to allow maximum utilization. The lenses are both classified according to the image size. The format of the lens (1/2 “, 1/3”, 1/4 “, etc.) derived from the ratio of the diameter to the available image produced. While it is cheaper to join the format of the lens with the size of the camera sensor, it is possible to use a larger lens on a camera smaller (image) – since the image requires only a minimum size along the sensor . Use a larger lens, it may be more beneficial occasions, offering a large depth of field (the distance range of the lens before the objects is far to be in focus). In turn, the existence of larger lenses means that the image of the area used is taken entirely from the central, the flattest part of the lens – causing less distortion at the corners and offering a better focus. CCTV lenses use assemblies “C” or “CS” that specify the type of lens adapter ring and its dimensions. The difference between the two types is the distance from the back of the mounting flange to the sensor face. This is known as the “back away from the tab.” With CS lenses, the distance is shorter, allowing the use of glass in smaller amounts and smaller, creating a more compact design lens. Most current CCTV cameras use CS mount type lens. A CS lens can be used only in a camera with a CS mount format. A lens assembly C can be used in a camera mount adapter ring CS adding 5 mm. The type of lens adapter ring and its dimensions are identical for both types of lenses, so either can be mounted on cameras with any type of assembly without causing any damage. However, the lenses are not fully interchangeable; lens combination / incorrect mounting would make it impossible to focus on the camera. 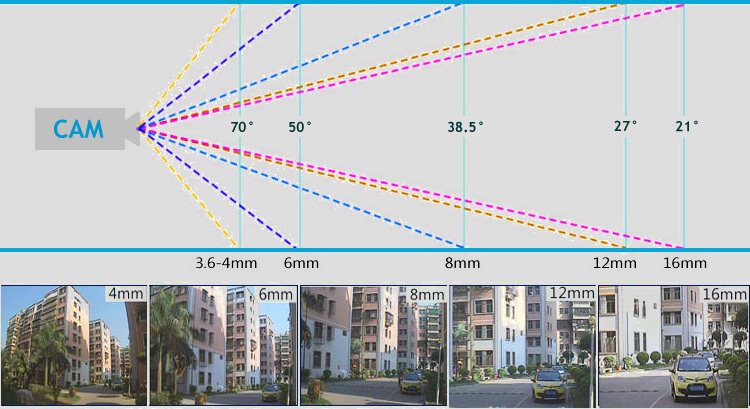 The focal length is the distance between the center of the lens and the image sensor. Rays from distant objects are condensed internally in the lens at a common point of the optical axis. The point at which the image sensor is positioned CCTV camera is called focal point. By design, the lenses have two main points: a primary and a secondary main point. The distance between the secondary principal point and the focal point (image sensor) determines the focal length of the lens. 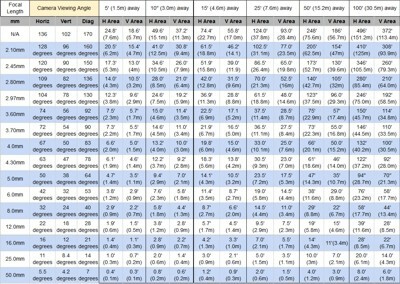 The measure of the focal length is expressed in millimeters. The lenses are defined as normal, wide angle or telephoto according to their focal length. For example, in a format 1/3 “camera, a lens 8 mm. Is normal as it is capable of capturing a wide field of view. Conversely, a lens of 125 mm. in the same chamber, in the same place observes a much narrower field of vision but significantly expand objects (long range lens). 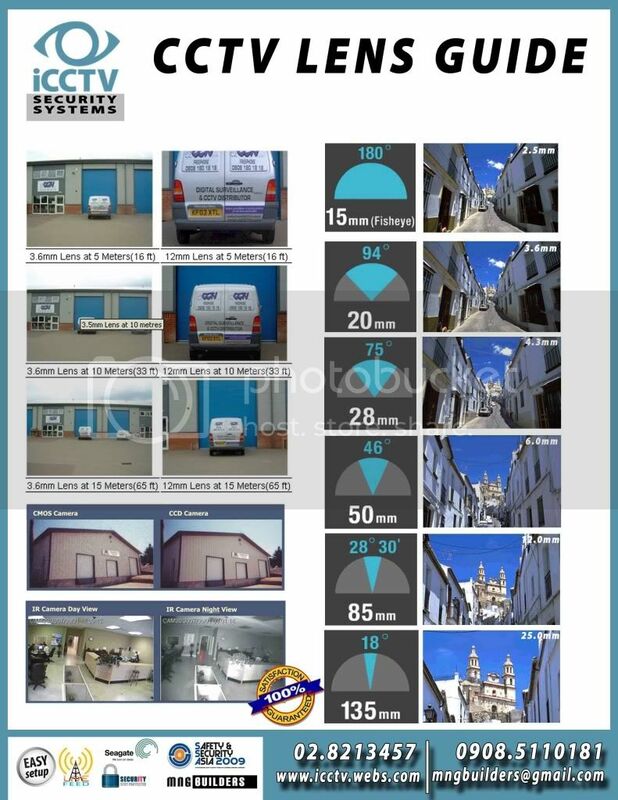 The field of view is the measure of how big is the area that a CCTV camera is able to observe. The FOV is based on the camera and lens. For example, the diagram below shows a quarter of 15 “x15”. 4 mm lens. 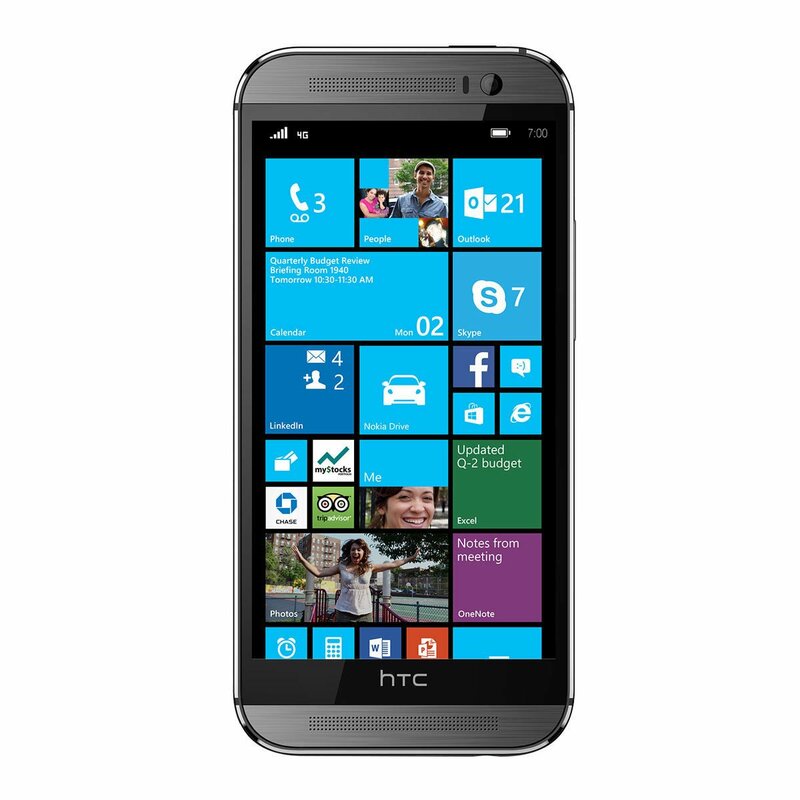 (Green arrows) allows better coverage display a wide – angle 12mm lens. In applications where a display is required nearest (for example, a cash register or a large distance), a lens 8 mm. or 12 mm. It is a better choice. The same camera at a distance of 21 feet with a 12mm lens., The FOV will be approximately 6 “Vertical and 9” horizontal. 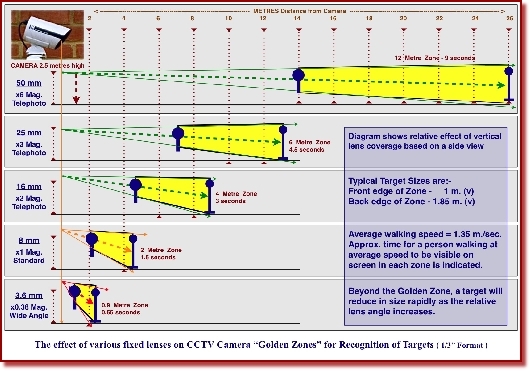 By increasing the focal length of the lens decreases the perceived distance to displayed area, but also decrease the area that the camera is capable of observing. Note the FOV diagram below to find approximate visualizations with different focal length lenses. How to choose CCTV Lens for different place?